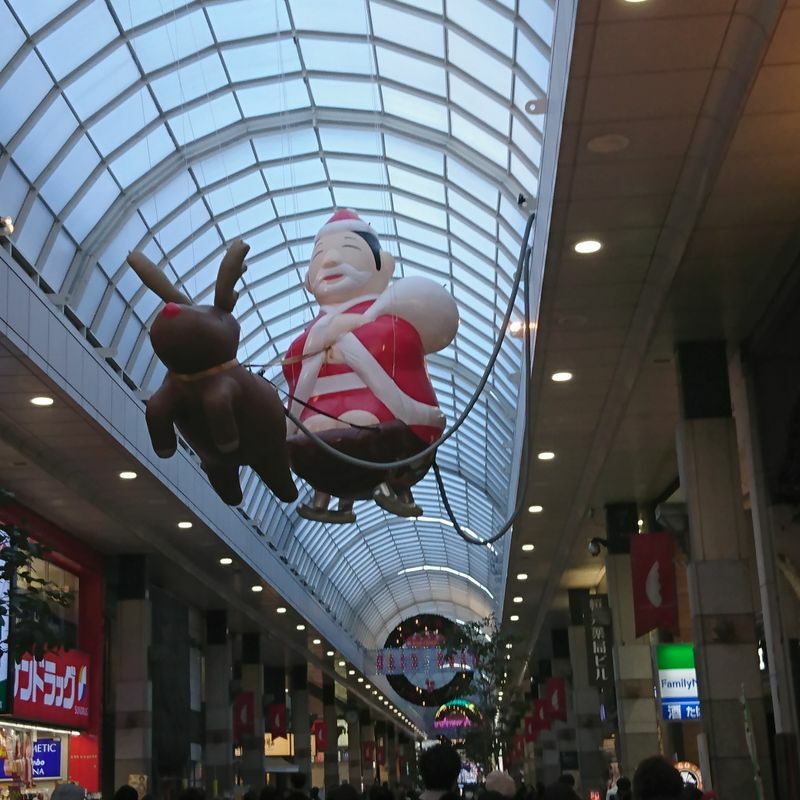 Christmas Shopping in Sendai occurs on Clis Road under the happy observance of this happily seated Santa-like figure, but who is he? My first winter in Tohoku, I thought this guy was "Japanese Santa Claus" and wondered why I had not seen similar weird things in Nagoya or Gifu. Perhaps it was just another weird northern thing. It didn't occur to me until much later that this guy was the same happy, sitting, shaved guy seen in stores, on signs and in many places around town. This is the guy in faded old photos in the souvenir shops. This is Sendai Shiro. 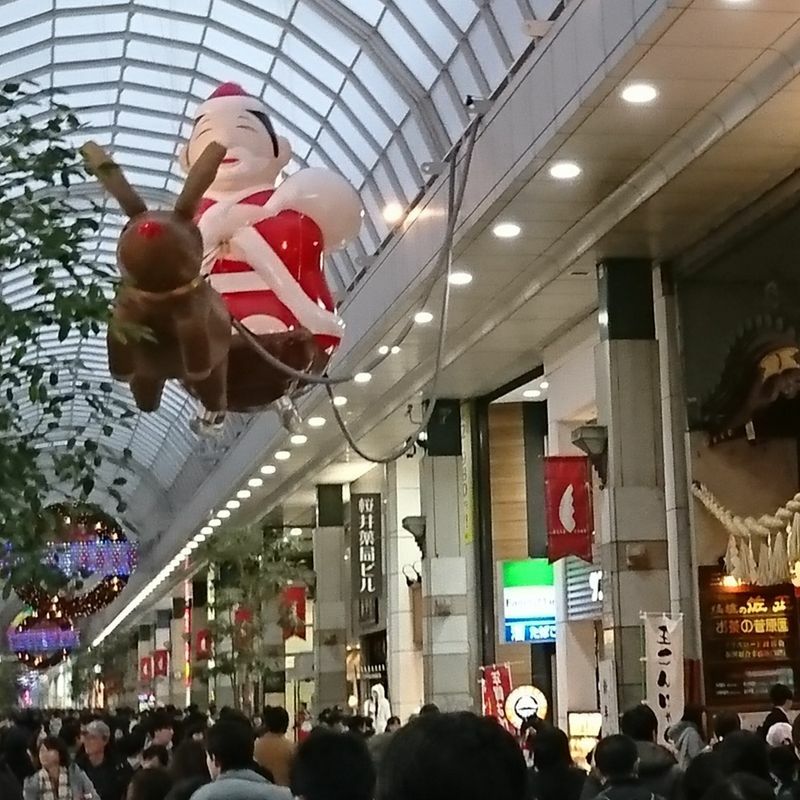 The Christmas Sendai Shiro Balloon hangs in front of the Mitakisanfudo Temple and Shrine along the Clis Road shopping arcade in downtown Sendai. The historical Sendai Shiro was a mentally challenged 19th century Sendai resident whose actual name was either Haga Toyotaka or Haga Shiro depending on the source in question. According to the stories, he was frequently seen wandering the shopping arcade, rarely speaking but always smiling. In depictions of him, Sendai Shiro is frequently seen sitting properly and smiling with a shaved head and slightly short robes, sometimes revealing a little more than one would want to see, but usually with an air of innocence rather than lechery. More recent depictions shy away from this detail, including the large Santa-style balloon decoration. Some smaller statues, however, can still be seen exposing something of a nub where nothing need exist. Perhaps it was meant to be the folds of his robe, or some other element of artistic expression that I have missed, but since my brother pointed out this aspect on a visit some years ago, it is all I can see when I look at some souvenirs. 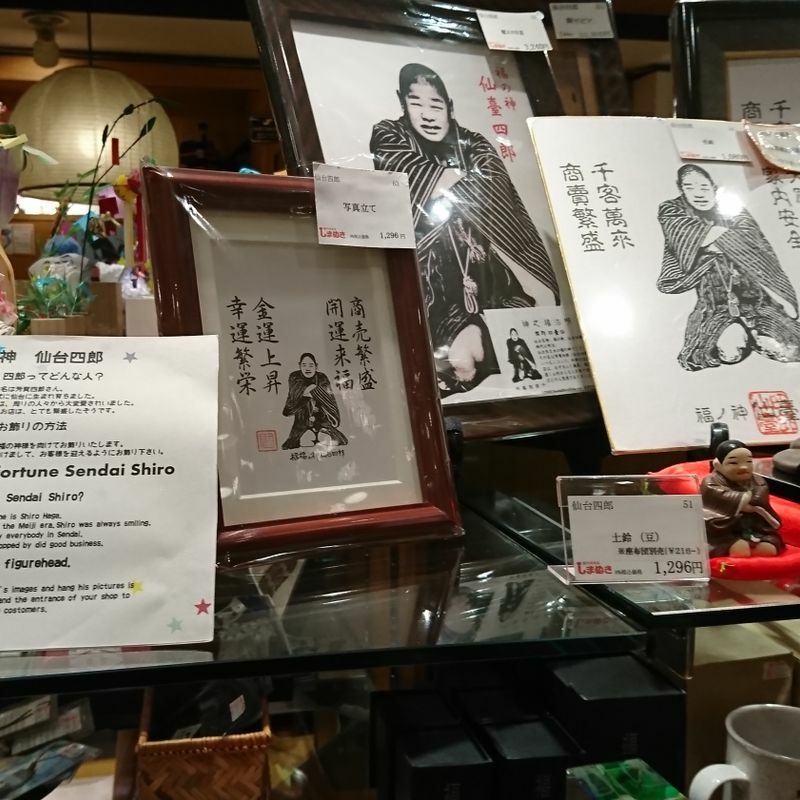 A small selection of Sendai Shiro goods available at one of the souvenir shops in the arcade. A good gift for someone who runs a small business. The shops he visited and enjoyed during his life would immediately see an upturn in visits from others, and the shops that treated him poorly usually fell on hard times. Logically, this can be better explained as those who cater to many clients, including those in short robes, generally see better outcome than those who turn away would-be financial gain for some other reason such as pride, greed, or ignorance. This could be a cultural a lesson on treating others well, but instead, he became a local saint-god figure for merchants and his visage can be viewed in a number of souvenir shops in Sendai and Matsushima as well as on the faces of the decorations that hang in front of Mitakisanfudo Shrine in the arcade, part of which is dedicated to Sendai Shiro himself! 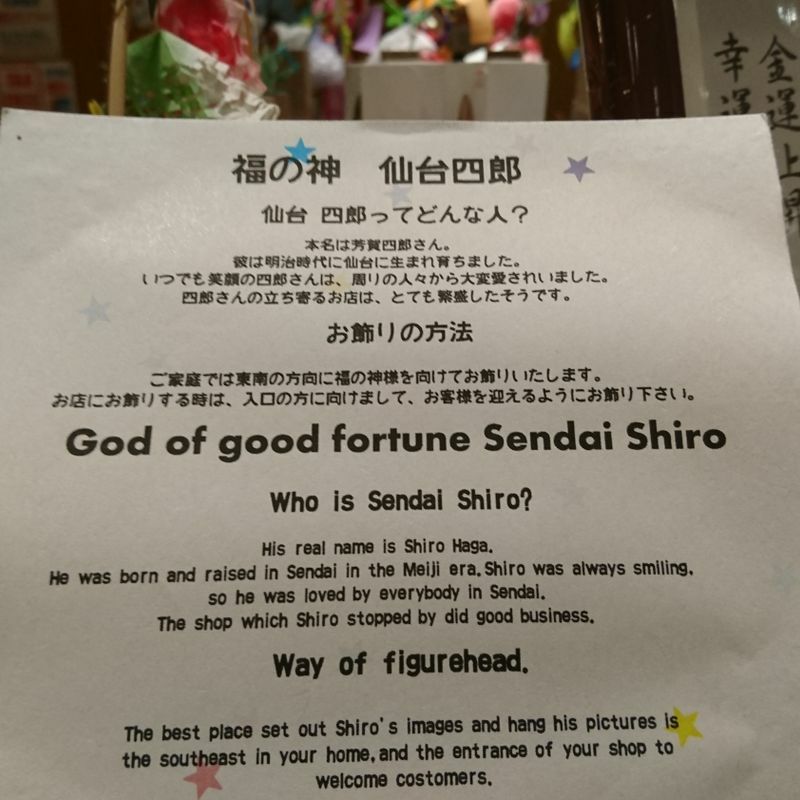 Explanation given in-shop regarding Sendai Shiro. 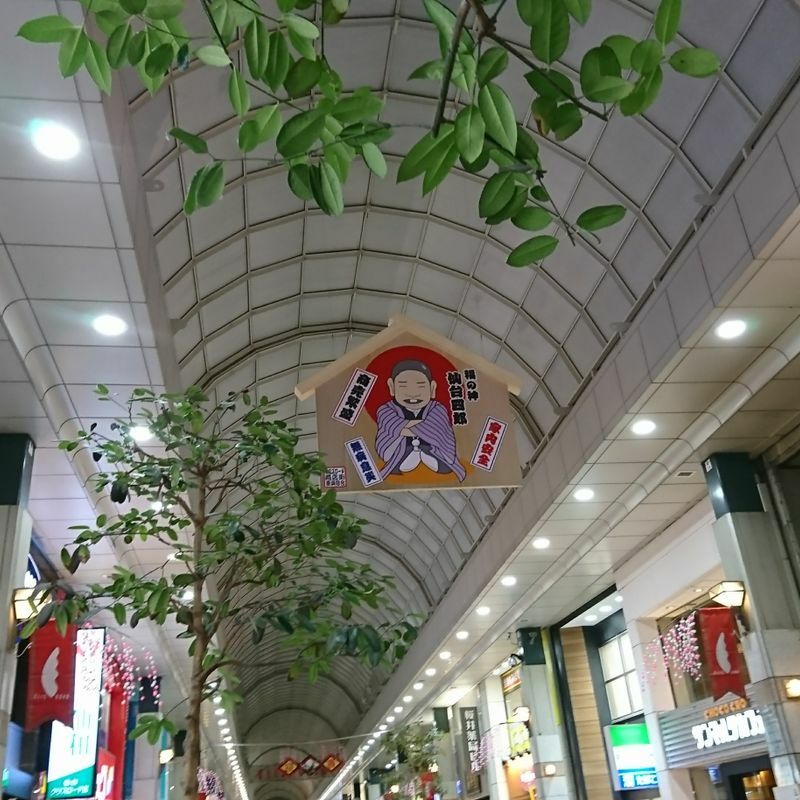 After Christmas ends, the decorations for New Years go up and instead of the Santa-clad Sendai Shiro with a reindeer-driven sleigh, guests to the shopping arcade are greeted by the placard-style decoration, still massive and hanging in the same spot, just in front of Mitakisanfudo Temple and Shrine above the walkway through the arcade. For the business people of Sendai, this folk-saint/local deity is considered a fantastic good luck charm, so if you or someone you love is running a small business somewhere, consider sending them a Sendai Shiro charm from the souvenir shops in Sendai or Mitakisanfudo Temple and Shrine in the arcade.